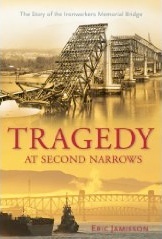 Browsing the second floor of the Chapters on Granville and Broadway one winter evening, trying out the SnapTell consumer product image recognition iPhone app, I happened upon Tragedy at Second Narrows: The Story of the Ironworkers Memorial Bridge by Eric Jamieson. Having seen it at another branch of the Canadian bookstore conglomerate, and not content to buy a hardcover, I reserved the book at the library then and there. A few weeks later, it arrived. Books borrowed from the local book repository must be more urgently read than those borrowed from friends, so I set about its 300 pages of Jamieson's history of the Burrard Inlet's second crossing. The book details the political machinations to sell the idea of the bridge, fund it, select the company to build the bridge, its initial construction and what led to its collapse while only half-built. After explaining the engineering mistakes and subsequent errors that led to 18 deaths of ironworkers, painters, and later, a diver, Jamieson examines the royal commission to investigate the collapse and the ironworkers strike and legal wranglings resulting from that strike. Some details, he concedes, he can only leave to mystery, such as who made a crucial correction to one of the calculation sheets and when. Books like these I can really dig into. It relates to a subject about which I know very little at the outset, in this case, bridge building, and the author takes the time to detail the context in which a singular event happened. The stories of all involved, from decision-makers to the planners to the engineers to the ironworkers to the rescue teams to the judges and lawyers and union officials, all serve to bundle the entire narrative of why Vancouver landmark fell down. Jamieson never condescends the non-engineers by explaining the physics involved thoroughly yet rewards those who have a technical background by teaching the lessons future generations can learn. Every chapter contains several photos of the bridge and participants in the story of its making and destruction and rebuilding. Especially compelling are the photos of the rescue and recovery operation, which show the massive scale of the destruction and the urgency to find survivors. I can't recommend this book enough to fans of Vancouver and its history. 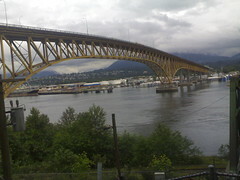 The Ironworkers Memorial Second Narrows Bridge figures daily in the lives of hundreds of thousands of Lower Mainlanders who need to cross the Burrard Inlet in their travel mode of choice. Jamieson has done the city and the bridge's builders a great service in recounting a terrible day for British Columbia in its then-unprecedented period of construction growth. If we are to believe in timestamps, on October 7th, 2006, I took over maintainership of the Mobile theme for the Drupal CMS. At the time there was no iPhone, and stripped down graphics-free versions of websites made it easier for people with small screens on their phones to get to the information quickly. Now, relatively larger screens coupled with effectively unlimited data plans make websites more consumable by tiny devices. My maintainership of the theme continues unabated, as today I (finally) released official 1.0 versions for Drupal 5 and Drupal 6, and dropped official support for the 4.7 version. m.justagwailo.com serves as the Mobile theme's demonstration site. Thanks to Bèr Kessels for originally writing the theme and webschuur.com for its original sponsorship. A note about version numbers: when the new system for CVS tagging came out way back when, somehow it occurred to me that "DRUPAL-6-4" was the correct version number to assign to a developmental release. What that meant in practices was the version number for the theme ended up as "4.x". Looking at the usage statistics, at this writing, the overwhelming majority of sites that have deployed the Mobile theme use that developmental release. It is my hope that they all move to the 1.x branch, either developmental or official, as that's where all development will happen from now on. As with any software, there are feature requests and bug reports, and I encourage anybody using the theme to give me feedback there. The theme is not to be confused with the Mobile Theme module, which cleverly detects whether a browser is a mobile device and serves up a "mobile" theme for that device. I have the combination of the Mobile Theme module and one of two iPhone-friendly themes at PDXphiles, my Portland-lovers blog. Talking about social media is boring, but what else do I have? For someone who wonders about the definition and value of productivity in the social applications era, and for someone who claims not to actually do much, my activity stream would make me appear like an active contributor to the world's knowledge. If that's the case, then here's how to follow me around online. The aggregated feed of my shared items (which includes Vimeo Likes, YouTube Favorites, Flickr Favorites, Diggs, Last.fm Loved Tracks, Twitter Favorites, Yahoo! Upcoming events, and Google Reader Shared Items/NetNewsWire Clippings, among a couple of others) is available at http://justagwailo.com/shared with an RSS feed at http://justagwailo.com/shared/feed). These the social applications that I use regularly these days, many of which are listed on my Elsewhere page, constantly updated with the services that I recall still using. Delicious: bookmarks related to work, specifically Drupal-related links, with some diversion into computer-based productivity and promoting the company a bit. On the consumption side, I only look at my network's link. Flickr: mostly mobile photos to play around with the iPhones geotagging. Syndicated at justagwailo.com/flickr (to play around with Drupal's functionality, see also the map). Twitter: a few times a day, much less frequently than before now that I have a private account, to stay a part of the conversation. I use the account @sillygwailo to post manually, and @justagwailo as a pinging service (mostly Brightkite, see below, but also my blog and other services that post directly, i.e. not via RSS, to Twitter). Last.fm: which gets all of my iTunes-played songs and most of my iPhone-played tracks. I play songs too often for it to automatically appear somewhere else without annoyance. Flickr to post mostly photos taken from the iPhone. Favorites appear in the shared items feed. Brightkite;: where's Richard? I check into almost any physical location that I remain at for more than 5 minutes other than my residence. The iPhone native app is top-notch, simple with all necessary, including listing nearby friends, few of which actually use it. Checkins appear in the ephemera Twitter account. The people tracking mentions of my workplace on Twitter must be annoyed by now! Some photos go directly to Brightkite, then to Flickr, then to both this site and the emphera Twitter account. All Consuming: to keep track of movies watched and books read, and sometimes beer drunk. Boris is my only contact that still uses the site, part of the Robot Co-op network. Consumed and consuming items appear in my shared items feed. Google Reader: switched back to it for personal feeds from NetNewsWire (still used for work feeds, some of which require authentication). Shared items appear in, you guessed it, my shared items feed. updating Twitter about any social media is boring, so instead, I use Identi.ca, a relatively obscure place for me to rant about spending too much time at a computer. my Tumblr page serves as an experimental spot for me to 'reblog' things. If there were an RSS feed for the Dashboard and an RSS feed for "Likes", you'd see me using it a lot more. I keep FriendFeed up-to-date with the various social networking sites I use, and that pipes things in there, but I don't use it much for consumption or interaction. The rare FriendFeed "Like" will appear in my shared items feed. GetSatisfaction will get more use in 2009, largely for low-threshold +1s of ideas already submitted. LinkedIn is the work/professional connections equivalent of Facebook. I barely use Facebook. Now that I have big list of social media applications, subsequent quarterly reviews will just highlight the services I pick up and drop, not the ones I continue to use extensively. Suw Charman, whom I met on IRC some years ago and later met at Northern Voice, tipped me off a few weeks ago that today is Ada Lovelace Day, celebrating both the woman heralded as the "first programmer" and women in technology generally. As part of my pledge, rather than list off those women in technology who inspire me and forget someone, I'll single out the obvious: my girlfriend Karen. Although we had chatted for a few days before, she and I met at a conference her university class held at the time about Information and Communication Technologies, or ICTs. Her presentation focused on the ICT response during the Indian Ocean tsunami of 2004 and since then she has impressed me with her ability to laterally think about social media and organizational and social change and make connections between emerging ideas in the field. Her appreciation of open source technology equals mine, and her understanding and drive towards transparent collaboration outpaces mine. She wants a better, working world and understands that social media finally puts us on that path. In 2009 we're still talking about "women in technology" and now we have a single day to highlight the achievements in the field. 2009! Why aren't we celebrating women and men in technology all the time? Why isn't it obvious that there are just as many female geeks as there are male geeks? Why isn't it normal that women roughly equal, in numbers, the employees of technical companies, in computing and otherwise? Why are women-in-technology conferences still necessary? Technology brought Karen and me together, and not a day goes by that she doesn't create another universe I hadn't thought of. Thank you, Suw, for making today a day to celebrate, but really, every day is Ada Lovelace Day. Why we only celebrate it on March 24th is beyond me. 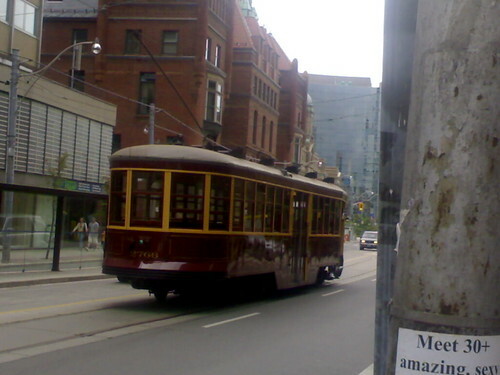 On a trip to Toronto in 2006, during the Canadian Pacific Exhibition, two older Toronto streetcars passed by Karen and me while we were walking the mean streets of The Big Smoke. Some years later, these informative comments from a user called booledozer appeared on the Flickr versions of the photos. “This is a "President Congress Car". This design was very widely used, sixty to seventy years ago. Boston and San Francisco also continued to use these cars until very recently. Personally, I prefer the old maroon and yellow livery. 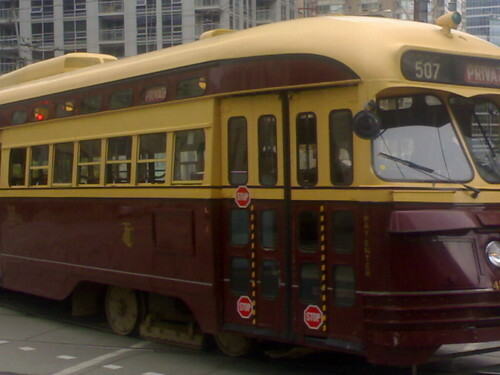 “The TTC calls this a "Peter de Witt" car. A quick Google search reveals there's no "de" in the name. I would never have known the name without the comment, however. 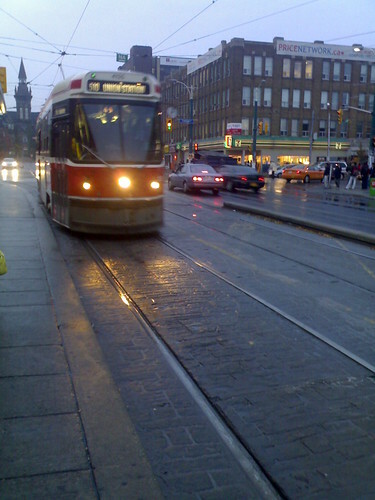 “The intersection in this picture is College and Spadina. The photographer would have been standing near the El Macombo, The Rolling Stones recorded a live album there. The photographer (me) used a cell phone camera to take those. what's the one specific goal you would like to work on today? which would you want to focus on? how much time do you think it'll take? do you know where you could go to find the person who can do it? how could you get the money? do you have any skills you can teach the person to do it? what's easier among your options? can the students write the grant? what do you need to do to get a student to say yes? are you clear on what to do? if you can't accept the way you are now, you can't change to where you want to be. that said, a strategy in one situation might work in another. Anthony Robbins - books are pretty interesting. when you schedule it, it's real. system to identify resistance and friction to working on your goals, don't get judgmental on it. instead of "what's going wrong? ", ask "what's going on?" In Part 3 I will wrap things up and talk a little more about the books that influenced me on this subject, both directly and indirectly, and the changes I hope to make in the next few weeks. Here are the notes I took of a self-debrief about my Northern Voice presentation last month about microblogging. I follow most of the advice Joe Clark gives about giving presentations and agree with all of it. Every presentation, including this one, I close anything that makes a unanticipated notification or unwanted sound, load up every website I intent to show in a tab well before the presentation. I don't do this often enough in a year to get smooth at it. Presumably Bruce Sharpe, who presented directly before me, will post video and/or audio of my presentation in the near future. definitely had enough material for half an hour. I went halfway through my slides. Perfect, since the presentation was front-loaded to the first half. The second half contained bonus material. I needed a projector adapter dongle thing, leaving it at home. Luckily I borrowed the previous presenter's dongle. I try to have my own. I needed the remote, which I lost sometime before the presentation. Managing without it, it would have went far more smoothly allowing me to go beyond the reach of my laptop. felt underprepared, not having done a proper run-through. Nobody seemed to notice. I wore a sweater. The conference documentarians used apel mikes. Next time I won't wear a sweater. one person came up to me after the presentation to talk about it more. I had no expectations either way. at least 15 people started following me on Twitter after I put up my first slide, which had only my Twitter username identifying me. Many have since unfollowed. 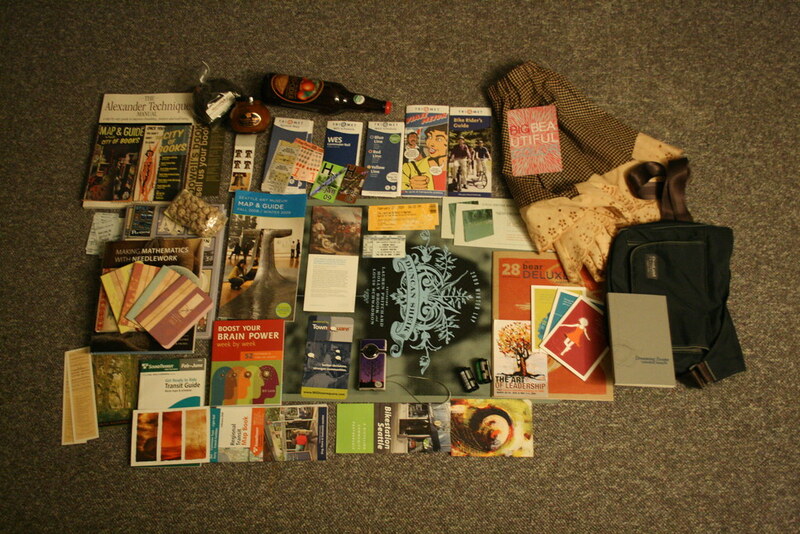 Inspired by the inventories Liz posts on Flickr, Karen and I decided to take a photo of everything we accumulated on our trip to Portland and then Seattle. We set physical we took from America on the floor and then stood on a chair to take the photo with our DSLR. Below is the photo plus a list of the items with some links, taken from the annotations Karen and I added to the Flickr photo. Two maps of Powell's City of Books in Portland. U.S. stamps for mailing postcards. Various TriMet maps, passes and info. From right to left: three maps, a comic in Spanish, and a bike rider's guide. The five passes are: one bus transfer, two weekly passes, and two "honored citizens" passes that I rescued from the trash. Two free Portland bridges bookmarks. That beat paying $19 for the poster of the same bridges. 4 Amtrak ticket stubs for the train trips we took from Portland to Seattle, then from Seattle to Vancouver. Artist postcard from gallery in the Pearl District. Pumpkin Butter with Port, from the "Made in Oregon" store. Dreaming Escape, a book of poems translated from Albanian. Seattle Art Museum tickets to Life, Liberty and the Pursuit of Happiness. We stumbled on it on our way to a concert, donated in the wrong box, plead our case, and got in as the result of the donation. Our little big purchase: the Flip MinoHD, with a custom design that I commissioned from @idleglory (flickr: rocketcandy). 2 rolls of film from the Fisheye camera, ISO 400 and ISO 200. Notebooks and a Jane Austen address book, also from Powell's. Apple Cider, obtained from the Farmer's Market. Bridges of Portland fridge magnet. Art gallery opening card from Moshi Moshi. The poster for Duncan Sheik's 2009 winter tour for Whisper House and Spring Awakening. We attended his shows in Portland and Seattle. Ticket stub from the Portland Duncan Sheik show. Skirt purchased from The Future Inc., which closed this past Saturday. An "Oregon Wilderness" postcard, the outlier of the 8 we sent in total to our American and Canadian friends on this trip. Apple Cinnamon Tea from Pike Place Public Market in Seattle. The entire kitchen smells like this tea now. On my trip to Portland last week, while my girlfriend went to the People's Farmer's Market, I took a jaunt over to the airport from downtown. To travel from the airport from downtown, I had to get a zone upgrade, because the 7-day pass we bought (see below) afforded us 2 zones. (We mostly traveled from Zone 2 through Zone 1 to the Fareless Square.) The fine folks at the TriMet information office at Pioneer Courthouse Square advised me that to get the zone upgrade, I would have to step on a bus, get an upgrade, and immediately disembark and hop on the train. I wasn't interested in risking getting caught by a fare inspector, so I made the trip to Gateway/Northeast 99th Avenue TC, hopped off the train, and got a zone upgrade from the #19 bus driver there. On the trip I took quite a bit of HD video using the Flip Mino HD camera we bought. Following is a Hillsboro-bound MAX train arriving at Gateway/Northeast 99th Avenue Transit Center (which I will refer to in conversation as "Gateway" after the SkyTrain station here in Greater Vancouver). Having a 7-day pass may not have been worth it from a purely financial perspective: as mentioned, we spent 5 days there in total and the pass did not apply to the Aerial Tram up to OHSU. (We would have appreciated a ticket stub as a memento of that trip. I sent a note to TriMet directly with that suggestion.) We did very much appreciate the convenience of the two-zone fare and not only the convenience of not having to fish for change, but being able to select which consecutive 7 days we could use the pass. In <a href=http://www.ttc.ca/Fares_and_passes/Passes/Weekly_pass.jsp">Toronto, you can't select which days. At least they have one, though: we'd love to be able to have weekly passes in Vancouver! On Friday at 3:00 PM, I'll speak very briefly about the subject of microblogging at Northern Voice 2009. My slides, in typical very minimalistic form, are done. For those interested in Twitter (and some of its related tools), as well as the location-centered Brightkite, I plan on spending talking for about 15 minutes discussing both the concept and the tools, then opening up the session, only a half-hour long in total, to conversation and questions. We've bought the tickets, so it's official: Karen and I will be going to Portland for the last week of February, then take a very short side-trip to Seattle on the way back. We're taking the Greyhound bus down from Vancouver, B.C., so we'll get a lot of Interstate 5 goodness. Since we didn't know exactly how we were getting back from Seattle, we decided that at least on the way from PDX to Seatown that we'd take the Amtrak train. A little more expensive, and the Amtrak guy in Vancouver wanted to see our passports. We managed to convince the ticket agent that we didn't know we needed them to buy tickets and that we had just made the decision (both true), so we'll finally be able to do as Djun did in 2005. We very tentatively decided to neither of us bring our laptops, the idea being that we'll find enough computing power with friends and cafes to check our email as much as we need to and that's it. I'll bring my iPhone, which I'm assured by the fine folks at Fido will cost me an arm and a leg to use the data plan while roaming in the United States. As part of our trip budget, I have an amount of total usage in mind. Again, friends and wifi in the wilds of PDX will get us jacked in when we need to. To update my thoughts on the PDX Bus iPhone application, the developer today had approved a 2.0 release of the app, which embeds Google Maps inside the application. It also adds a flashing screen to make it easier for TriMet bus drivers to see you. I didn't believe that TriMet actually recommending this, but the transportation agency itself has an explanatory video, including asking for what are called in Vancouver "request stops", i.e. getting dropped off anywhere along the route, not just at designated stops. Digging in the crates over the Christmas holidays led to a journal article read in my days as a political science major at Simon Fraser University. Writing an article titled "The Dynamic of Secessions: Scenarios after a pro-Separatist Vote in a Quebec Referendum" in the September 1995 edition of the Canadian Journal of Political Science, a professor at the Université de Montréal reviewed several books by his contemporaries discussing what impact--economic, bureaucratic, political, etc.--the largely French-speaking province of Canada deciding to leave confederation would have both on the "Rest of Canada" (ROC) and the newly created country itself. The author of that article: the former leader of the Liberal party of Canada, Stéphane Dion. Along with Jean Chrétien, then prime minister of Canada, Dion architected the Canadian government's position on the conditions under which Canada would negotiate with a separate Quebec. Reading Dion's review article after more than a dozen years to simmer, Dion appears to have clearly thought about the questions surrounding what happens not leading up to the referendum, but in the days after a Yes vote. the secessionist claim of legitimacy is certainly disputable. The position adopted by Quebec secessionist leaders suffers from a double moral standard: allowed a right to secede from Canada, they deny anyone the right to secede from an independent Quebec. They cannot justify such a double standard on the grounds of either Canadian Constitutional law or public international law. They consider a 50 per cent plus one vote sufficient to justify secession, while democratic conventions hold that critical decisions, those that cannot be reviewed without high costs, must be taken by qualified majorities. As fro the 50 plus one rule, the view that a slight majority for the Yes vote in Quebec is sufficient to secede is likly to be challenged if the proportion of citizens that agree with this rule remains so low, both in Quebec and the ROC. intellectual curiosity. One would like to know which scenario is the most accurate: the inevitable secession, the impossible secession...or the Parizeau scenario [i.e. a smooth secession]. As a political scientist, my clear interest lies in voting Yes. But I am a citizen, after all! Synchronizing your calendar between devices is still a mess. My personal calendar is on one account, my work calendar is shared with my personal account, and my girlfriend shares her calender with me as well. Initially I tried NuevaSync's Microsoft Exchange server to have over-the-air synchronization, and that worked well, allowing me to create events and have them appear, right away, on the Google Calendar account without intervention from iCal. The downside of NuevaSync was that every calendar event appeared as if it were on one calendar, so I couldn't tell which was work, which was her event (imagine everybody's surprise if I were to show up to an appointment she had with a heath care professional! ), and which was a personal life event. Google had CalDAV integration in beta, and recently launched it as an official service. That worked to keep iCal on my Mac synchronized well, but I could not add events from my iPhone. Having to move events over after a sync is not a habit I'm willing to form. Spanning Sync is the least worst option, an endorsement that probably won't appear on their site. Through Spanning Sync, I get all my events in neat calendars but still have to manually synchronize the iPhone with the computer. It's something I have to do periodically anyway, so no loss there. The holy grail, of course, is direct, instant iPhone-to-Google Calendar synchronization. Boris schooled me to Spanning Sync's referral program, which means that when anybody clicks through his image link, he gets a cool $5 sent to his PayPal account. Anybody clicking through that image also gets a cool $5 off the product. So in the spirit of trying to get something for free in an honest way, I encourage those frustrated with the state of calendar synchronization to click the image at the very top here to get me a fin, the term for a 5-dollar bill I learned from watching The Simpsons.